I usually find that January and February are the dullest months of the year, but that was before I decided to start a Scouts troupe and a craft guild simultaneously while working, cranking out new stuff from my studio, and cleaning (hah!) my house. Some of those things are going well and some things are falling down the rabbit hole. Scouts and the craft guild are going great! House is okay, not bad, but studio is not going well at all....In desperation, I moved a load of stuff back over, to tempt myself into taking up camp and getting stuck in again, but it was freezing and so I unpacked the boxes and hightailed it out of there. I will be heading back tomorrow, but it won't be for long periods of time until the weather warms up some. It's just hard to stick -5 with no heat, especially when sewing requires sitting for lengths of time and felting is a wet process that would leave me with even colder hands. My right arm has also been giving me some grief, something about tendonitis, so I've had to take it easy. Never a dull moment. Make a beautiful felted book cover? We had our first meeting for the craft guild, changed the name to Craft in Kerry due to Google search engines, and are off to a flying start! We have our first event, a craft fair, scheduled for Friday, April, 29th at An Díseart in Dingle from 10-4pm. We will have craft demonstrations and try to give it a real family atmosphere, given that two festivals will be taking place at the same time. We have our next meeting scheduled for Monday, February 21st in the Carlton Hotel in Tralee at 7:30p.m. Lots to discuss! Details for membership to finalize, publicity ideas, logo's hopefully will be ready to vote on, and we have an interview on Radio Kerry to get ready for! Weeshie Fogarty rang me and said he would be delighted to give us an hour's interview on his "In Conversation with..." show on Wednesday nights from 6-7:00pm. Our slot isn't until March 30th, but we need the time to get press packs ready, start a blog, decide which five members are doing the interview, and get him some background info on our coming events. Meanwhile, Nationwide was in contact and they are coming to Dingle to film us for the craft fair, so it's time to get organized! 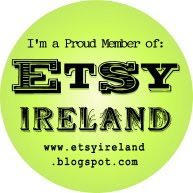 I did get a Facebook, page up and running, so you can look us up under http://www.facebook.com/KateOConor?ref=ts#!/pages/Craft-in-Kerry/172314459478834. Learn the easy and transformative process of felting, one of the oldest textiles in the world. With wool, warm water, and a little soap and energy, you can create all kinds of wonderful items. We will focus on the process of making felt and then felt book covers that can be used as journals, sketchbooks, or photo albums. They make a wonderful gift, but you may want to keep it for yourself! Materials provided on the day, but please book in advance. All abilities welcome, but preferably age 14 and up. 087-9111793. I know the workshop fee is very small, but it's really hard to fill workshops right now. In the good old times, I could easily have charged €50 for the three hours. Any thoughts???
. There will be a meeting Monday, January 17th at 730pm at PAUL GEANEY'S to organized a handmade artisan guild, tentatively named KerryHandmade. There's lots to discuss, including setting up a committee, grant possibilities, craft fairs, and workshops. Since this is the Year of Craft there seems to be a rush to schedule lots of activities, but there is also the opportunity to promote Kerry crafts and get a bit of money to do it, too. If you are in Kerry and you make handmade goods, please try to attend the meeting. Not only will we be able to market together and save money, but we will also raise the profile of all handmade goods in Kerry. Speaking of marketing, I am currently reading Un Marketing by Scott Stratten. It was a recommended read by Etsy and I have to say it is worth every penny. It kind of validates all the ideas that I have had about cold calling and how it does not work. In a nutshell, people sell themselves as trusted individuals first before they ever sell a product. Important to remember as a sole trader. Do spend the money to buy the book because it makes so many valid points. In the meantime, I have stressed the tendons in my right arm, so my felting and crocheting is very slow right now. Not very convenient, but there you go. I can use the sewing machine, so maybe I should concentrate on that for now. There are lots of plans for this year, but it seems to be off to a very slow start!! Is anyone else experiencing roadblocks??? Dreaming of 2011?? I think so. If I am to endure poverty and obscurity, WHY not in Kerry? We have a house and friends and a life here, I have my studio. It just seems overwhelming and financially devastating to start over again back in Seattle. My wee little start into a textile career would be sucked away into the recession abyss and my training and struggling would be for a hobby, not a career. Just can't face that. If I am staying, then I am investing myself MORE and not less into Kerry. I want to put Kerry on the map for handmade goods and crafts tourism. First stop is KerryHandmade, a guild for handmade artists of all disciplines. I am organizing a meeting for Monday, January 17 at 7:30pm at Benner's Hotel in Dingle, Co Kerry. This meeting is for all handmade artisans throughout Kerry, so spread the word. We will be discussing the purpose of the group, how to get our message out, and a craft fair possibility during the Pan Celtic/Feile na Bealtaine on Friday, April 29th. There will also be workshop teaching possibilities throughout the Feile. If you make handmade goods, please plan on attending as this will be of great benefit to you! I have high hopes to get something going to really start branding areas of Kerry as centres of creativity --no, I wasn't going to say excellence!! Come along and we will see how to get the ball rolling. As dreary as December felt, January is certainly looking up. You can't keep a good optimist down!